The role of community in schools consists of the connections between schools and individuals, businesses, and formal and informal organizations and institutions that can leverage community resources and assist students in achieving positive outcomes. The notion that community has an important role in the education of America’s children is long-standing and is a central theme of education reform. Community members partnering on the ground can ensure safety and provide support (e.g., neighbors along route to school) and community agencies partnering between systems (e.g., child welfare, law enforcement, libraries) offer protective factors that can contribute to student resilience as well as help efficiently and effectively address issues when they arise. Schools can benefit from additional resources to educate students and these resources, whether material or human capital, can be provided by members of a student’s community. Society has placed mounting responsibilities on schools as they strive to educate a student population that is becoming increasingly diverse and often described as increasingly at risk. Far too many schools and school systems are struggling to carry out their basic educational mission because they are overwhelmed by the social and emotional needs of children who are growing up in poverty and unsafe environments. Opportunities to partner with community stakeholders (e.g., community service providers) can help schools meet student needs the school may not be able to address alone. Involvement of community members in schools can improve the overall quality of education that students receive. The traditional isolated manner in which many schools have functioned is ineffective in a time of changing family demographics, demanding workplace dynamics, and growing student diversity. Thus, it is important for schools to be open to the involvement of the wider local community. The support community agencies/groups can provide to families allow parents to better meet the needs of and support their children, thereby helping set the proper conditions for learning and improving school climate for all. Community involvement is one way to help schools produce a more capable workforce. Jobs in the 21st century operate in an increasingly complicated environment and require a workforce that is competent beyond the basic skill level. Students need advanced language, technical, and interpersonal skills in order to succeed in current jobs and those that will become available. School–community partnerships, specifically those that involve relationships with businesses, business leaders, managers, and other personnel, are uniquely equipped to assist schools with the preparation of students for the changing workplace. Adelman, H., & Taylor, L. (2007). Fostering school, family, and community involvement. Washington, DC: Hamilton Fish Institute on School and Community Violence; Portland, OR: Northwest Regional Educational Laboratory. 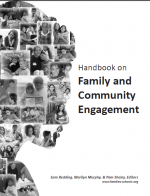 Includes materials to create a community event using promising bullying response strategies. The toolkit helps communities plan, execute and assess community events and includes resources for each stage of the campaign. Contains resources to conduct an assessment before the event, a sample template agenda for the day of the event, and follow up steps. Finds supporting evidence for the hypothesis that, in elementary age behavioral development, cognition about the acceptability of aggressive behavior is influenced by group expectations and sanctions, but not by the actual presence and extent of aggressive behavior.